Airpura T600 Air Purifier for Smoke & Odor Removal | Pure n Natural – Pure n Natural Systems, Inc.
560 CFM | Airpura T-600 portable tobacco smoke and odor air purifier. Tar-Barrier pre-filter plus 26 pounds of activated carbon removes over 4,000 chemicals, gases & odors from cigarettes, cigars, pipes, hookah and marijuana smoke. Portable floor model / can also be wall mounted. Limited Time Only - 6-pack of tarbarrier pre-filters with purchase of T600 - $99.00 Value - FREE! Get the Smoke Out with the Airpura T600 Smoke Air Purifier. The Airpura T600 is the best portable air purifier to remove cigarette smoke and smoke odor. The Airpura T600 will effectively remove airborne chemicals, tars, and gases. The specially designed TarBarrier pre-filter combined with 26 POUNDS of carbon, will effectively combat 4,000+ chemicals and gases found in tobacco smoke. Tobacco smoke contains some of the most toxic chemicals and gases, including benzene, toluene, formaldehyde, plus numerous carcinogens. Not to mention tar and tar residues. 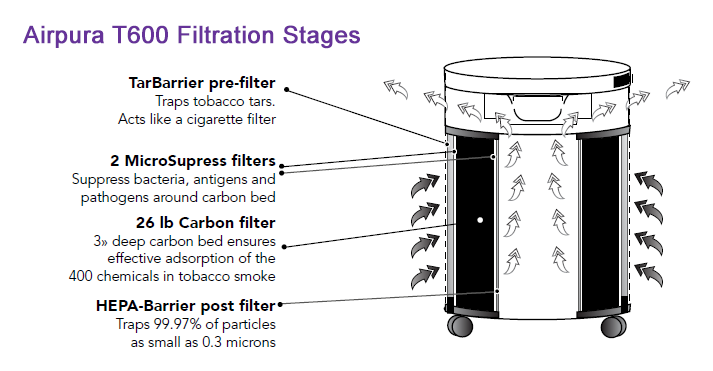 The TarBarrier filter in the T600 air purifier will trap tobacco tar and keep them out of your breathing zone. Consequently, this will help to reduce the effects of 2nd hand, environmental tobacco smoke - ETS - and will keep the peace between smokers and non-smokers. The Airpura T600 Smoke Air Purifier is the Best Air Purifier for Cigarette Smoke, Cigar Smoke, Hookah Smoke, Marijuana Smoke, and Pipe Tobacco Smoke. The powerful 560 CFM motor/fan in the Airpura T-600 smoke air purifier will recycle the air approximately every 30 minutes in areas up to 2,000 square feet. This is beneficial to keep the air free from harmful smoke & odors. Optional wall hanging brackets are available for easy wall-mount installation. Each Airpura T-600 smoke air purifier comes fully equipped with (1) of each filter; TarBarrier pre-filter, 26# carbon filter, HEPA-Barrier post filter. Replace every 1-3 months, depending on usage. Stage 2 - 26 Pound Carbon Filter - Carbon is KING when it comes to cigarette smoke odor, gas, and chemical removal. It will adsorb airborne chemicals including formaldehyde, toluene, benzene, volatile organic compounds (VOC's) and more. How does the carbon continue to adsorb chemicals and odors for such a long time? Activated carbon has millions of tiny pores in-between the carbon atoms. Adsorption is the process where certain chemicals, gases, VOC's and odors are attracted to and then bond to activated carbon. Millions of pores in the activated carbon provide an enormous surface area to adsorb chemicals. The 26-pound carbon module is surrounded by 2 - MicroSupress filters. They will suppress bacteria, antigens, and pathogens. Replace the carbon ring every 2 years. Stage 3 - HEPA-Barrier Post Filter - A specially designed post filter will trap any carbon dust or particles that escape from the carbon bed. Replace the HEPA-Barrier post filter every 12-18 months. Contact Time - The amount of time that the chemical contaminants are in contact with the 26-pound carbon bed is critical. Therefore, 560 CFM motor combined with the variable speed control allows you to set the airflow precisely to achieve the results you need. Pressure Seal - This feature ensures that ALL air passing through the Airpura T600 comes in contact with ALL filters. The unique pressure seal combined with a reusable gasket constructed of a poly/wool blend is constructed without glue, silicone or rubber compounds. All Metal Housing - Because the unit is metal, it does not off-gas. Unlike some plastic housings, the Airpura T600 smoke air purifier features a perforated, powder-coated steel housing. This not only offers a softer appearance but allows for 360-degree air intake and distribution. Plus, the T600 air purifier will not emit VOC's or plastic vapors into your environment. Backward Curved Motorized Impeller - A smaller yet more powerful motor enhances airflow while keeping noise level to a minimum. Variable speed up to 560 CFM so you can choose the ideal level of airflow. Because of the unique position of the motor internal turbulence and does not interfere with airflow. Environmentally Conscious Design - The Airpura T600 cigarette smoke air purifier does not contain any plastic, rubber, silicone, adhesives or bonding agents (other than a minute amount required to meet UL, ETL, CE and CSA safety requirements). The capacitors are PCB free and NO lead is used in soldering the speed control. Rivet fastening, despite a slightly higher cost and more time, is used instead of spot welding. This prevents additional off-gassing of particles and chemical vapors including greenhouse gases. The ingenious 'sock' filter liner in the carbon bed allows for better airflow throughout the carbon granules while reducing the amount of material used.